I am probably going way off into left field from what a lot of others might pick, but my pick for this question will forever and always be Professor Snape. I have a thing for tortured souls, and this man is as tortured as they come. Looks on the outside sometimes never compare to what is on the inside. I, like most people thought he was evil in the beginning - until you learn who he truly is and then you see him in an entirely different light. He was smart, charming (in his own way), loyally devoted to those he loved and he believed with such fierceness that his wrongs would play out into rights when the time was right. He just needed love. I am sure, without a doubt, with love - we would have seen a Snape none of us where ready for. We all start somewhere in life that leads us on a path to the person we are meant to become. 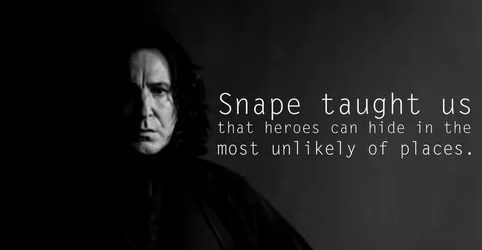 Snape touched so many people in his years at Hogwarts - it's a shame that not many of them ever took the time to look WITHIN and see the person he WAS, instead of the person he put out as the front to others. I am glad I picked him. I was going to write this prompt with Lupin as my response, but it just did not feel right. I was also convinced that he was evil in this whole thing - she really threw me for a loop there!